Spiral Steel Pipes, made by low carbon steel, are also called spiral welded steel tube or spiral welded pipe. 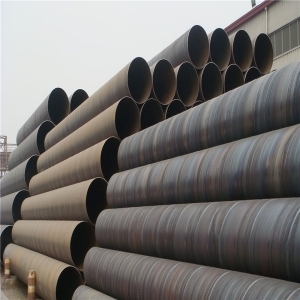 According to its technology and craft, the spiral welded pipe is made by Low carbon steel or Low alloy structural steel in terms of specific angle of spiral line to roll into tube blank, then formed the pipe with specific thickness and length after welded the seam of low carbon steel pipe. Sino East Steel ensure to provide outstanding quality of spiral welded steel tubes due to we have involved in steel industry for 10 years experiences of producing and trading. Related tensile strength and cold bending properties could withstand authoritative test if the oversea buyers are with any requirement of test of spiral welded steel tube. In accordance with spiral welding feature, it may produce large diameter steel pipe by using good quality narrow steel strips. Sino East Steel as steel manufacturer may supply the spiral steel tubes in correspondence with standard AWWA C200, ASTM A139 and ASTM A252. For uses of spiral welded steel tube, at the first the welding ways are important reference such as Arc welded pipe, High frequency or low frequency electric resistance welded pipe, Gas welded pipe, Furnace welded pipe or Bondi pipe and so on. 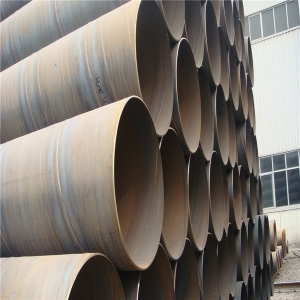 The welded steel pipe is used in oil drilling and mechanical manufacturing; the furnace welded pipes can be used as water-supply or gas-supply pipes; large diameter straight seam welded pipes for high pressure oil and gas transmission; the spiral welded pipes exactly are for oil and gas transmission (Treatment Plant Piping, Pump Station Piping), pipe piles, piers, pipeline aerial crossing, aqueducts and so on. At the first, the spiral welded steel pipe meets to high strength comparing with longitudinal welded pipe. The second, according to the test of relevant research institutes in the United States, although the spiral welded pipe and the straight welded pipe(ERW pipe) are in the same grade, the spiral welded steel pipe has higher impact toughness. The third, the spiral tubes match to high fatigue strength as same as seamless steel pipe’s and electric resistance welded pipe’s (ERW pipe). The fourth, the size is accurate, the diameter tolerance is less than 0.12%, the deflection is less than 1/2000, and the ellipse is less than 1%. The fifth, under the same pressure condition, the stress of spiral weld is lower than that of the straight weld, which is 75%to 90% of that of straight weld pipe, so it can withstand higher pressure. Stainless steel pipe ensure its higher malleability and ducticity than spiral carbon steel pipe, while spiral stainless steel pipe realizes its spiral welding process as well as spiral steel pipe’s.